Before, blogging, FB, Twitter, Instagram and Pinterest, I spent a lot more time knitting, crocheting, embroidering and cross-stitching. When we moved, I sorted through all of my supplies and made a startling discovery. It seems I have a habit of starting something and then discovering something else I'd like to do - thus laying aside the first project. Do it often enough and you end up with an inordinate number of unfinished projects. I decided then and there that I would not start another new project until I finished the ones I had already started (with the exception of the baby sweater I knitted because - sweet babies). I'm beginning to make some progress. I finished a couple of cross-stitch pieces - framed one and gave the other to a friend. I felt a happy sense of accomplishment. 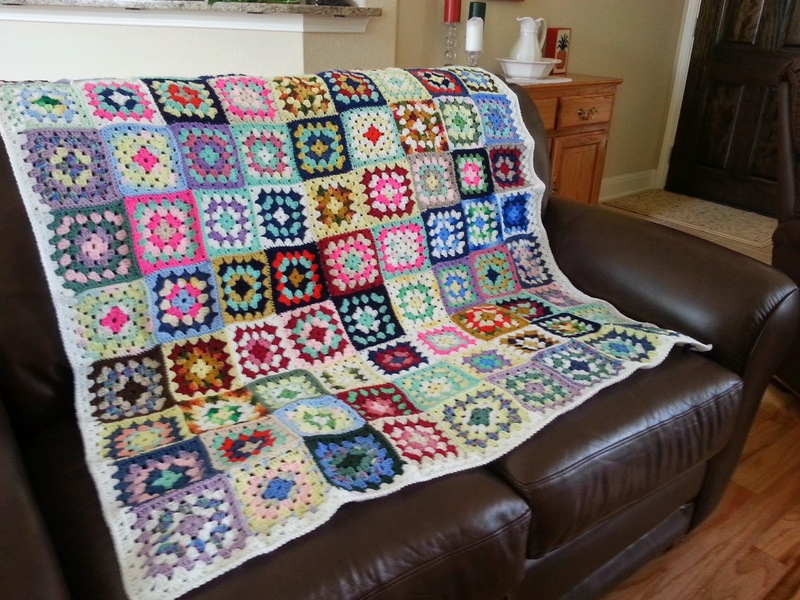 Then I tackled the one that had languished the longest - a granny-square afghan. I can't even remember when I started making the squares. Years ago - literally. Every now and then I'd sew a few together. I even had a family member (who shall remain nameless) help with part of the project. As it turned out, said family member sewed a great many of them wrong side out necessitating a great deal of ripping out of seams. But I digress. A couple of squares, the ones I just couldn't get ripped out because they were sewn in so tightly by the nameless family member, are still wrong side out. Some of the squares are bigger than others (I think I may have used the wrong size crochet hook at one point), so it has a sort of "ripply look around the edges. But it's colorful and sweet, and reminds me that things don't have to be perfect to be loved and used well. Now to get to that quilt that's collecting dust on the closet shelf.